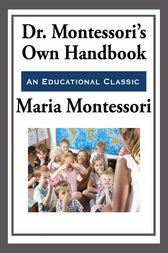 This classic best-seller is a reproduction Dr. Maria Montessori's Classic Education Book "Dr. Montessori's own Handbook" originally published in 1914. One of the truly great books on early childhood development, this brief guide instructs parents and teachers on how to use familiar, easy-to-obtain classroom materials to make the home an effective learning environment. The book covers methods for engaging youngsters in learning while stimulating and honing their visual, auditory, and tactile perceptions. An illustrated guide to the use of Montessori classroom materials. Describes how to set up a "children's house" - an environment for learning where children can be their own masters.